More often not the most moving works of art affect us through making us aware of what is not there, what is lost, withheld or shrouded in ambiguity. Tacita Dean, whose work can be seen in Melbourne's ACCA here in a decent and beautifully staged survey show, creates pieces across media that can often hypnotise as we look for meaning between their lightness of touch and boldness of subject matter, which might be mortality itself. Although best known for her film pieces Dean works with found objects, or makes the ones she creates appear random, her seemingly guileless way of shooting (although 'capturing' might be more appropriate) has an important aesthetic effect. She creates images that have the untidy half formed feel of memories, she is at the mercy of light and that slightly spectral feel to all of her work is what makes it so beguiling here, although it isn't always as substantial as we might like to believe it is. One of Dean's themes is loss, that's clear. She looks at decay and erasure, of the fleeting nature of memory. The redundancy of film is of course a theme made almost literal in the 'Kodak' piece. A long film that follows, often on a fixed and only barely composed camera, the workings of a French celluloid film factory. The tone and the subject suggest elegy, but what works most effectively is the way she captures, on her film, the play of light in the Kodak factory, it is almost an essay in the particularity of a medium. What makes her choice of medium more than a nice intellectual irony is the very presence of film in the gallery. As the constant whirr or projectors hums through the rooms you can't help but be aware of the delicacy of the film racing through sprockets and spindles. The medium itself is precarious, it reminds us that it is not only technology but memory too that has its own mortality. A more direct hint of death comes in the shape of 'Die Regimenstochter' a collection of thirty six opera and theatre programmes. In the gallery their meaning is not quite apparent, each is from Berlin, and has a window cut out of their covers, revealing a page inside. They appear ghostly but little else. Since seeing the exhibition I've discovered that the holes cut from them are from where swastikas have been removed. That realisation changes their meaning immediately, suddenly they are ghosts of a people as well as acts of defiance where evil is excised from a culture. The work becomes as powerful as a holocaust reminder. However one has to question the effectiveness of a work of art whose meaning is quite so reliant on knowledge of the provenance of found objects and not on their presentation. Perhaps that clear link would have felt gauche and artless but it would have fulfilled the communicative function of art. Dean is wonderful poet of surfaces, of how they are at once opaque and revealing. 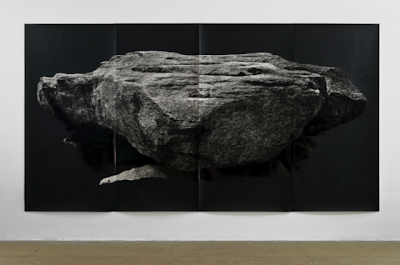 The giant photographic prints of lichen encrusted rock that fill two walls of the first room, 'Small Study for Hünengrab II (Floating'), say this most clearly. Printed in black and white on a high gloss paper all but the rock itself has been masked out with a matt black paint. It makes what is so essentially solid appear weightless and with nothing else to distract us we can only focus on surface. To call a piece about a poet poetic is almost too obvious. But 'Michael Hamburger' has all the rhythmic power of metre and verse. Dean captures images in the expatriate poet's home and garden that vibrate with strange resonance. The day is rainy, the sky bruised and there is a very English drizzle in the air. Behind the occasional birdsong is an irregular thrum, that might be the encroachment of a nearby road into this very English country garden. Dean lets the camera linger, rain drips from leaf, birds alight and then fly away leaving a feeder swinging just as shadows paint their way across the green. And then there's the apples. We see their skins throughout, shining, mottled, ripening, blemished, we watch the care with which the old poet harvests them down, with an incongruous red plastic device and the way he handles them as he gives a history of his orchard. The film would be touching if the only sound was Hamburger's personal and learned description of apple types, each seems to take on the quality of metaphor for unspoken experiences, but he then goes on to recite his poem in memoriam of Ted Hughes. A faint half-moon, haloed in haze half-earthly. Adored for that, seducer to sacrifice. Then it is love that hurts, not the coldness. In remembrance of him and his garden. Hardened, mellowed the fruit to outlast our days. The piece is pitch perfect, Hamburger delivers his poem in a painfully stoic rhythm and we understand how objects can be elegies for fleeting lives. This is Dean at her best. My reservations with Dean's work come from the way she clings to the deliberate evasions of the avant garde. The long, still, unwavering shots are like a challenge to boredom, like some kind of test of a viewers patience before they are allowed to receive their moment of revelation. Those tricks aren't terribly new and represent a doctrinaire barrier between artist and viewer, one that Dean is well able to break. 'Merce Cunningham Performs 'Stillness' (in three movements) to John Cage's composition 4'33" with Trevor Carlson, New York City, 28 April 2007 (six performances; six films)' has so many of the individual pieces of the Emperor's New Clothes that it's amazing that, thanks to its beautiful lighting and the way it is staged on six screens with six projectors, some images appearing to float in the air, it does not collapse under the weight of its own title. '4'33"' is Cage's arch piece of conceptualism, a period of scored silence. It is a performance in the very loosest sense, Cunningham a real nonagenerian genius of modern dance, sits in different ways throughout. However, again, there are layers outside the film itself. Cage and Cunningham were lovers and thus that very famous silence is embued with emotion it never had as a conceptual trick. I like what Tacita Dean does, although not all of it. She works with a sensitivity to the physical that gives her opportunities to create things that are achingly powerful. The power of some of the pieces here lies in their modesty, they are gentle and curious and like the change in the wash of light as a cloud passes over they can reveal much that is profound. That's quite a beautiful quality for an artist.